It was the year that produced Oklahoma’s most recent national championship, brought the school back to football prominence and defined the Bob Stoops era of Sooner football. 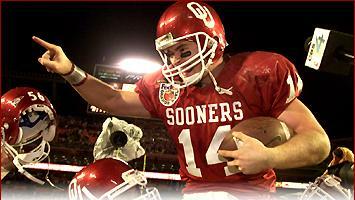 Seventeen years ago, Oklahoma surprised the nation – and possibly themselves – by putting together a dream season that stands as the most unlikely undefeated campaign in OU history. 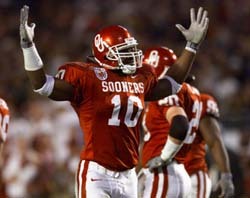 What Oklahoma accomplished in the 2000 season was unprecedented. No Sooner team had won 13 games in a season and no team since has gone unbeaten. When the campaign started, no one suspected what was about to unfold. The previous year, Stoops first in Norman, OU had gone 7-5 and closed the season with a loss to Mississippi in the Independence Bowl – hardly the foundation for a national contender. But Stoops had put together an up and coming coaching staff, an innovative offense installed by the departed Mike Leach, who left after one season to be the head coach at Texas Tech, and he had recruited what turned out to be the nucleus of a rock solid defense that was to be the key to the title run. The Sooners began the season ranked in the lower regions of the top 20 and walked through an easy non-conference schedule to slowly begin their climb in the ratings and into the national consciousness. But it wasn’t until they took on Texas in the annual Red River Rivalry that people started to believing Oklahoma was ready for a return to glory. In what was to ignite their march toward a spot in the national title game, the Sooners started what is now referred to as “Red October” by crushing 10th ranked Texas, 63-14, in Dallas as running back Quentin Griffin scored a record six touchdowns. It was OU’s first victory in the series in four years and began a run of five straight wins over the Longhorns. The following week, OU had climbed to number eight in the national rankings, but had to go on the road at then-number two Kansas State. Behind the offense run by senior quarterback Josh Heupel, OU won 41-31 to make another leap to number three and set up yet another titanic battle against the number one ranked Nebraska Cornhuskers. With the formation of the Big 12, the series between OU and Nebraska had ceased to become an annual affair after the 1997 season – mercifully so for the Sooners, who had lost by back to back scores of 73-21 and 69-7 in the last two meetings. But things had changed in Norman since then. Stoops had taken over the program and had the Sooner faithful excited with the undefeated start. This would be his first meeting against Nebraska and a win over the top rated Huskers would complete a month-long march through murderer’s row and reestablish Oklahoma as a national power. It would not be easy. The Sooners fell behind 14-0 early, as Heupel struggled in the opening quarter. Just as many fans started thinking that the OU streak was over, the defense quickly took command, holding the Huskers to just 16 yards in the second quarter. And Heupel, who was now being mentioned in the Heisman Trophy race, heated up. He was 7 of 10 in the second quarter, including a 34-yard TD to Curtis Fagan to tie the game 11 minutes before halftime. By the time the teams headed to the locker room, OU had added 10 more points to take a 24-14 lead. For all practical purposes, the game was over. OU’s defense added the only score of the second half, as the Sooners scored the last 31 points of the game. Heupel finished 20 of 34 for 300 yards and Oklahoma had served notice that they not only were back, but also were ready to contend for an undefeated season and national championship. For the first time in anyone’s memory, OU fans tore down the goal posts after the victory. It was the first, and most definitely, the last time that would happen during Bob Stoops reign. Now it was the Sooners’ turn to sit atop the national ratings, taking over the number one spot for the first time since their last national title in 1985. Two weeks later, they found themselves the marked team, on the road at Texas A&M and trailing in the fourth quarter, when linebacker Torrance Marshall intercepted a pass and ran it back for a touchdown, providing the winning margin in a 35-31 victory. Oklahoma finished the regular season unbeaten with a close 12-7 win over Oklahoma State in Stillwater, then won for the second time against Kansas State in the Big 12 Championship game. After that, on to Miami for the Orange Bowl and the national title game against Florida State, where some of the Sooners had extra incentive for the contest. Even though they were ranked number one and the Seminoles were third, the Sooners still weren’t getting the proper respect, with Florida State a double-digit favorite in the game. Heupel had also finished second in the Heisman Trophy race to Seminole’s 27-year old quarterback Chris Weinke, which did not sit well with linebacker Marshall. During the pre-game coin toss Marshall announced to Weinke that he was there “to get my boy’s Heisman back”. They may not have taken back the Heisman, but the OU defense dominated and bewildered Florida State and Weinke all night long. The only two points for the Seminoles came on a safety when the Sooners botched a punt attempt in their own end zone. OU won 13-2, capturing the schools seventh national title and putting Oklahoma football back in its rightful place among the nation’s elite programs. The celebrations when the team returned to Norman were carried on live television and the players treated like rock stars. Unknown to the nation when the season began, Heupel, linebacker Rocky Calmus and kick returner J.T. Thatcher became first-team All-Americans, while players like Roy Williams, Derrick Strait, and Andre Woolfolk would go on to become first round NFL draft picks in subsequent years. A dozen players on the squad would go on to play professional football, but it was a number of the unsung squad members who represented the heart and soul of that championship team. Center Bubba Burcham was a lightly recruited player out of high school who suffered through the lean years prior to Stoops’ arrival. Transfer defensive tackle Chad Heinecke and walk-on linebacker Roger Steffen were also major contributors. As is usually the case with championship teams, things had to go absolutely perfect for the dream season to materialize. There were comebacks and fortuitous bounces and the Sooners went the entire season without a major injury – a far cry from recent seasons that have seen talented players fall by the wayside. The confidence began to build after the Texas game and hit its crescendo in the title game. Much of that has to be attributed to Stoops, who instilled a work ethic in his squad that has carried on through his entire tenure. As Teddy Lehman, a freshman contributor on the team who went on to become an All-American before his career ended, summed it up, winning became natural for the team because of their preparation. “I never played in a game at Oklahoma – even the ones that we lost in later years – where I ever thought we were going to lose” said Lehman. OU has had several more chances since that perfect 2000 season to capture additional national titles, but all have ended in defeat. More than a decade had passed and fans are wondering when that eighth championship will arrive. As those who followed the miracle that unfolded fourteen years ago can tell you, it will likely happen when you least expect it.